Decided to snag a newbie in my Newcommer swap that I had open for almost a year. Its a swap on cutoutandkeep.net to help put some xp under the new ppls belts. All together: I made her a set of matchbook/notebooks, a green pouch, a pink pouch with 4 slots to put her crochet needles in, heart shaped felt stitch markers, a kawaii keychain, a domino pendant and a heart felt ring. vampire moon bunnies have arrived!! As you may have read in my past posts about the Vampire Moon Bunnies. We have recieved the awesome bunnies that Kiddo had made for the girls!! Emma at first was hesitant, she didn't want the bunny to "get" her. LOL!!! Then she warmed up and was next to me having it "eat" my arm. It was really cute and funny too! I also got a ring from her, the little felt creature that I mention in her post that it would be an awesome ring!! AND NOW I HAVE THAT AWESOME RING!!! WOOT WOOT!! THANKS KIDDO!!! WE LUV YOU! Yep you read the title right, For awhile now I was curious if Texas was immune to Earthquakes and I got my answer tonight when my cousin(who lives in Kingsville,Tx) wrote on her fb about it. I don't think there was any damage, she said she didn't even feel it, Where it happen was maybe 25-40 minutes away. It was a 4.0. But now I am really curious, am I the only one that has been noticing more of these occurrence more and more lately? Just think about all the earthquakes we been having all over the world, and a volcano blowing its top, is there something the Earth is trying to tell us? Just curious questions from a very curious person here. Whats your intake in the matter? *band aid for those small scrapes from chasing zombies. *bottle of pills for those minor aches and pains. *Grenade for throwing at a horde. *Gun for taking out those undead creatures. SO as some of you know I play LEFT4DEAD 2....and since March, Valve has been saying they plan on releasing "the passing" DLC. But for some crazy reason no one really knows why but it was place on hold....all they could get from Valve was that it would be release in "Spring"....that really don't help out when the exact date of the release would be. So after every day of checking people's blogs on the date, I had given up. I refused to touch the points that will be used for it. Then out of the blue today, my brother pops up on MSN and gives me a link saying it will be release on THURSDAY!!!!! I am excited and can't wait!! Now hopefully there will be no mix ups and be ready for downloading bright and early on that day while I drink my morning coffee. Well you guys will also guess what I will be doing this upcoming weekend! mwhahahaha!!! 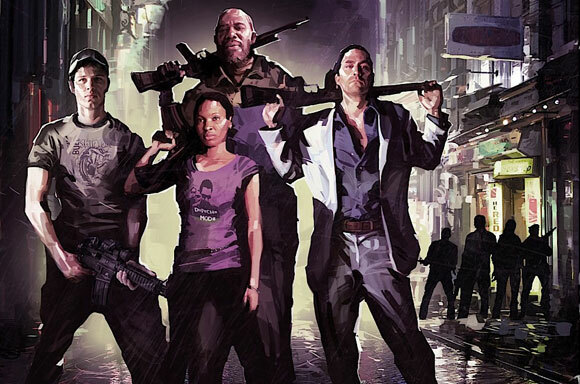 MEETS THE CAST OF LEFT 4 DEAD 2! Anyone else play on the xbox 360? On the dark side of the moon, where its dark and cold there lived terrible creatures that hop around on the zero gravity crater infested moon. They are evil creatures that wait for parents to bring their little naughty children to them for them to scare them into being good once again. These horrible creatures are the Vampire Moon Bunnies!!! So this story came along since my Little Emma is going through her terrible 3's with a vengeance. I might as well have a separate blog just of her adventures. This story came into action when a weekend ago we all went to Lillian's school for Spring Carnival. Emma was told by the person in charge of the bouncy house that her time was up and that she needed to slide down so the other little kids could have a turn. She didn't like this at all. She screamed out in frustration and picked up one of her flip flops and ninja thrown it at an innocent bystander. I am not one to spank my kids unless the crime fits. It was already time to go. So we dragged the screaming Emma to the car and proceeded to go Hobby Lobby before we went home. So this is how the Vampire Moon Bunnies came too be. I also notice that my friend Kiddo was in a bunny plushie kick. When Emma saw one of her bunnies she asked me if that is what the Vampire Moon Bunny looked liked. So grinning with the idea I messaged Kiddo and asked if she could make this little request for the girls. Kiddo did a great job!! A friend of ours let Emma try out the app on his phone "talking carl". We dont think she understood that Talking Carl repeats you say but its still hilarious! Testing out the new mobile for blogger. A friend of mine who has fibromyalgia, had been givin a site by the fibromylgia funding orgnaziation in her name. I would like those who read my blog to go visit the link and donate, it can be a dollar, anything will be greatful and apprciated. Cary Pfalz a.k.a Cabootique is a wonderful creative person. She enjoys making jewlery and placing it on her etsy for her lovely creations can be adopted to their new owners. So please take the time to check out the link for me and donate a dollar(s). So my daughter Lillian (7) had to write a short story at school. I had to share her little imagination with you guys. I will translate the best as I can. "Cute went to the carnival. She got stuck in the bouncy house. She did the big jump ever. Before she did that she put fairy dust on her and flew away. It happen at 10:oo. Then she went to the North Pool. She got stuck in a penguin trap. She yeld for help, and Santa Claus heard her and got her out and took her back home." So this is what I did today. :D Preparing them for my shop! I am trying to figure out how to make a video and I having major difficulties in uploading, so once I figure that out I will post my first video. 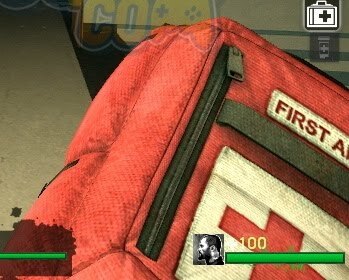 My first attempt on making a Left4dead first aid kit....and it was a complete failure. 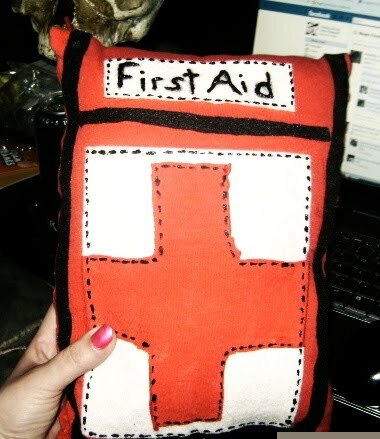 I didnt realize I was out of red felt but I was determine to try and make a pillow out of it. So here it is. Not the best but I know what needs to be worked on when I try again. I went to the store earlier and grabbed me tons of red felt! Go Me! So stay turn for that one. Just the tshirt material makes it look very flimsy and red felt has more of a uniform shape. I have some other ideas so I think I will get started on that soon. so I had this dream that I was battling zombies with magical powers...it was fun using my mind to explode the brains of the undead. Thought I would share this with you all! lol!! CLICK IMAGE TO SEE IT IN FULL SIZE! Finally after getting settle in new place the crafty mojo has return with vengence!!! Check out what I did today!! Also made rings too I will post the rings that I made too later on. Its Zombie killing time! !